Solar Power System Design For The Home. The general layout of a residential solar power system design is shown in the image below (thanks to the Dept. of Energy). This article discusses the different components of designing a Solar Panel system for a home. Solar panels on the house roof (or other area that isn't easily obstructed) capture and convert the sun's energy into electrical energy. 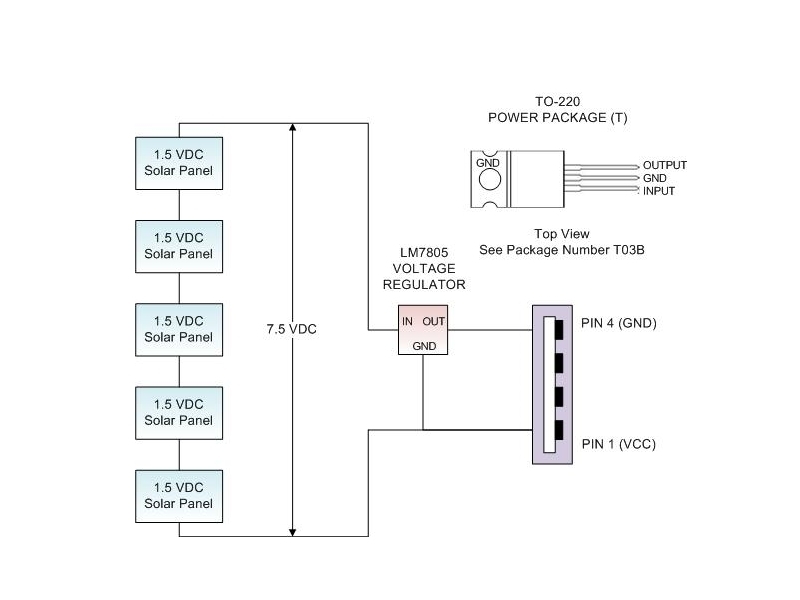 Residential solar panels typically provide a voltage in the range of 12-48VDC. We discuss DC voltage in our DC vs AC post - click here to jump to that post. A junction box is where the different solar panels are tied together - typically in parallel to provide more current. 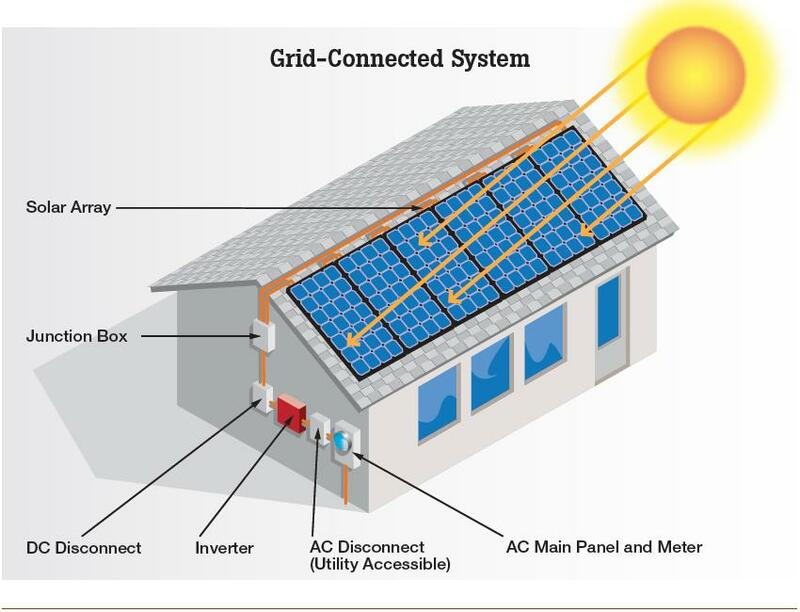 In the above solar power system design diagram, there are 6 panels tied together. If a junction box is used, the wire from the solar panel to the junction box can be a smaller gauge (actually a higher gauge number). If the solar panels were tied together on the roof, the wire would have to handle the combined current of all the solar panels. Also, if a solar panel had a problem, it could drain the energy that the other panels are providing. A good way to isolate each panel is to use a blocking diode on each solar panel string inside the junction box. Although it is not shown in this solar power system diagram, the excess energy could be stored in storage batteries. The solar panels would keep the batteries charged. Typically a charge controller is used to maintain the battery bank at optimal charge and also prevent overcharging. If a battery bank is used, the battery bank would be connected to the solar panels in the junction box or a separate junction box. These batteries would attach to the solar panels on the wires before they feed into the DC disconnect and then the inverter. The DC disconnect is a safety device used to isolate the solar panels from the inverter. This is necessary for maintenance and troubleshooting of system problems. The DC disconnect typically consists of a breaker switch housed in a normal electrical junction box. An inverter converts the DC voltage into an AC voltage. Most houses and appliances use an AC voltage (that is what a standard outlet is). They will convert the 12 to 48VDC to 120VAC. If the homeowner is getting AC power from the power company (the grid), they will need a grid tie inverter. These inverters match the AC wave to the AC wave coming from the power company. If the house doesn't have AC power attached, a regular inverter can be used. For instance, a summer cabin in the mountains wouldn't require a grid-tie inverter. Grid tie inverters are typically more expensive than normal inverters. This is where the Inverter connects to the house wiring and by extension, the power company's meter. Similar to the DC disconnect, this is used to isolate the solar power system from the house and/or the grid. This is useful for maintenance and troubleshooting as well as blackouts where we don't want to power the entire neighborhood - only our house. In many cases AC disconnects are required by the utility company for their use and are typically located near the meter. As you can see from the solar power system design diagram, electricity is also supplied by the power company via power lines. Their power goes through a power meter before entering the home. The power company checks this meter each month and bills the homeowner according to the amount of electricity used. 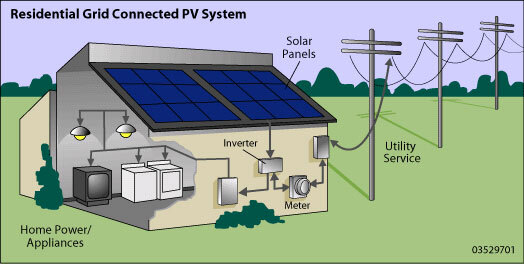 In the above solar power system diagram, a double arrow is drawn between the inverter and the power meter. In theory, if the solar panels are supplying more electricity than is used, the meter will turn backward because the power will be sent back out on the power lines. Unfortunately, many newer power meters only turn in one direction - the direction that energy is consumed by the homeowner. However, the solar panels do supplement the power used by the home. If a dryer is being used on a sunny day, the amount of power consumed is the same but a portion of the power is supplied by the solar panels so the meter will turn slower and indicate that less power is used. It is apparent from the above picture and discussion that having solar panels will reduce the power supply burden that the power companies must supply and transfer on their transmission lines. In the future this will become more important. No one wants a repeat of the rolling blackouts, and this is a great solution. Learn more by signing up here for our free solar power newsletter with articles, tips and products that focus on solar power or use our RSS feed. Even better, check back on our website often to see the newest content concerning solar power system design. Passive solar energy is the use of solar power without any active mechanical devices to convert or act on the energy. This is opposed to the idea of active solar power systems which use solar panels to collect the sunlight and convert it into electricity. Generally passive solar designs do not require any conventionally generated or supplied power to run, however there are exceptions to this rule, where a small amount of power supplied by “normal” or conventional means is used to control aspects of the passive solar designed system. Passive solar power systems can be used to heat your home, heat your swimming pool, provide hot water for household use, and can even be used to ensure your home has good ventilation and air circulation. There are also examples of bad passive solar design, in which rooms within a dwelling become very difficult to cool in summer and this can lead to inefficient use of power hungry air conditioner systems. Quite often, installing external shading or louvers can significantly improve the unwanted heating of a room by solar energy. Adding thermal mass is often used to smooth out the highs and lows of temperature variation, so that a building can be cooler through the day and warmer at night. Practically this can be achieved in building design using some more traditional building materials such as stone or by adding thermal mass to the walls and/or flooring slab or support. Solar chimneys can use convention to naturally move air by means of heating the air in an exposed chimney, which rises and in turn draws stale air up from a building below, and this technique can be very effective in ensuring air circulation without requiring electrically driven fans or other equipment. Other uses of passive solar technology include solar cookers, which have solar reflective arrays or mirror systems to concentrate the sun's rays into a central area containing a cooking vessel. These have particular interest in remote or developing areas, where conventional electricity or gas or even wood supply for burning are just simply not available. More specialized uses of passive solar technology can include solar forges and concentrators for extreme heating of a small area. These require very careful alignment to achieve the necessary concentration of energy into a small central area. In a truly modern energy efficient, green environmentally conscious building, there is a role for both passive and active solar energy systems. Good insulation, good building design principles and clever use of solar power panels and electricity generation schemes can all have a part to play in ensuring we reduce the reliance on conventionally generated power in our society. Photovoltaic solar electric panels, or PV modules, generate electricity by converting sunlight directly into power. The PV modules generate direct current, or DC electricity. DC electricity is what you’ll typically find in batteries. Direct current flows in one direction (more about this vs. AC below). DC is typically hard to transmit over long distances because the voltage can’t be easily increased. The source generation needs to be matched to the load and the distance from the load. In a long transmission line, the voltage drop is current * resistance or (I *R). Wire has a fixed resistance so you need a high starting voltage to overcome the voltage drop. At the beginning of the electrical revolution, many different types of generators were needed to match various loads such as lights, motors and railway systems. You can see that this can quickly get out of hand. An interesting wikipedia article discussing the argument between Edison (DC proponent) and Tesla (AC proponent) can be found at this History of Electrical Power Transmission link. Is there a solution to this type of problem? Luckily there is and it comes in the form of AC electricity. Remember how the voltage drop in a wire is I * R? Well, if the current is 1/10 of the DC example, we’ll only get 0.792V of drop (0.1A * 7.92 ohms = 0.792V). In this case, the voltage would be 120V while the current would be 0.1A. Just before the motor, we can place a 10:1 (10 to 1) transformer which would convert 120V to 12V and the 0.1A to 1A. We have the same result 12V at 1A, but we’re getting less loss in the wire. Additionally, the wire will heat up less as a result of the lower current (the 7.92V drop is dissipated as heat). You may be wondering at this point, why this is important. I wanted to discuss why AC power is used throughout the home. I also wanted to point out that the electricity that is produced by solar panels isn't directly compatible with the power in your home. I'll have additional posts are articles in my newsletter to discuss these issues. Sign up here for our free newsletter to stay informed of future articles. With electric rates on the rise again (another rise occurred for the new financial year), and yet more hikes predicted as government policy changes, homeowners everywhere are warming to the idea of installing solar panels on their rooftops and taking back some control of the household energy. This article will walk you through the steps to installing a full commercial system, such as those available from BP Solar, in your home. Solar modules or panels are made up of many silicon cells all securely mounted together into convenient strong panel structures. The panels have no moving parts, and baring breakage, will last for many, many years. They are lightweight, and so the roof will not need any extra bracing or strengthening and very easy to install. Typically solar panels should be mounted facing south for Northern hemisphere homes or north if you live in the Southern hemisphere. If this is not possible, that doesn’t mean you can’t have solar panels, South East, South West, or even East or West facing panels are still possible. Professional installers will use a device called a “solar pathfinder” to plot shading through the day and can work out the best position to install the modules to get the greatest amount of sunshine throughout the year. Installation starts by the fitting of horizontal rails across the selected area of roof. The modules are then simply held onto the rails using clips. It is a good idea to have a gap between the roof and the bottom of the solar modules to allow for air flow under the panels, as this will help in keeping the panels themselves cool which leads to greater efficiency. The modules/panels are then wired together to form a solar panel array and the array is then wired down through the roof to an “inverter” typically mounted in the garage. The inverter is a device which converts the direct current (DC) power produced by the solar panels into alternating current (AC) power which is the standard for most homes in America and elsewhere. The compact inverter mounts on the wall and won’t take up too much space. The inverter is then wired to your circuit breaker (fuse) box and this feeds the power into your home. After the system is all set up, you can practically see the benefits if you have an older style rotating power meter, as you will see the wheel turn slower than it would have. In fact, it is possible for you to generate more power via your new solar array than the household is using, causing the electricity meter to spin backwards. The excess power is fed back into the electricity grid for credits on your bill actually EARNING you money as you are selling power back to the company. Doesn’t that feel good! A point that is often missed is that solar electric panels operate very differently from solar hot water heaters, and can operate well even if the weather is very cold. In fact, with the same amount of sunlight on a cold day, they will work better as they are generally more efficient at cooler temperatures. With the barriers to installing solar power modules for the average household dropping away day by day, more and more people are turning towards solar power generation to save money and take back control of the contentious issues involved in more “traditional” power generation means like coal. And with state incentives and rebates on your bills for solar improving all the time, you can genuinely save money month to month, and increase the resale value of your home. What are the benefits of solar panels on your home? Installing solar panels on the roof of your home can be a great investment that saves you considerable money, helps the environment and also increases the value of your home. Over the last few years the use of solar panels within residential and farming housing has grown enormously, and with good reason. Not only do you immediately save on your utilities bill, also in a lot of areas there are fantastic government rebates and incentives. This is one of the best times to build a solar power installation in the United States. The 2008 Recovery Act has some fantastic tax incentives for solar and wind power. These incentives are in the form of a tax credit which is even better than a tax deduction. Read more about the Tax Credits here. Costs of the panels have dropped over the last few years, and for those willing to put in a bit of “do it yourself” effort, armed with the right know-how the costs are even lower, and the step to free energy from the sun has never been easier. It is now possible to build solar panel or panels and assemble your own array to make the entry cost very low. See our build-it-yourself series of articles here. If you have suffered through a rolling blackout in Texas or California, you know what it feels like to feel helpless. The nation's electricity grid is sometimes over-whelmed and therefore not everyone can be provided electricity. The power companies will shut down different sectors for 1-2 hours at a time. If you are producing electricity locally with solar, you can still power some of your more important applicances such as refrigerators, etc. Not only can the energy you collect from the sun using your own solar panel array compete with the conventional grid utility power supply in terms of cost, in some cases you can even sell your excess generated solar electricity back to the grid – how is that for reversing the utility bill situation! How Hard Is It To Get These Benefits? If your home is located in the northern hemisphere, and you have a good south facing roof area that is not too overshadowed and gets reasonable sunlight through the day, you have a ready made spot to put your solar panel array. If you are in the southern hemisphere, take a look at your north facing roof area as a good location for the panels. These days solar panels make a convincing argument to switch from coal burning conventional “unclean” energy sources to clean, abundant, cheap power right where it is needed – in the home. The benefits of solar panels for your home are numerous and we'll start to see more adoption of solar panels as time goes on. Sign up here for the Solar Power Newsletter to learn more about Solar Energy. Have you ever had your cell phone or mp3 player die and you're not close to a computer? In many cases, today's cell phones and other portable electronics use a standard miniUSB or microUSB jack. That means you can use a standard computer's USB cable to charge your phone or mp3 player. This post discusses the components of a typical solar USB Charger. Slowly charging the battery when it is completely discharged until it gets to a point where it can begin fast charging. Fast charging the battery while monitoring the vital signs of the battery like the temperature, voltage, and limiting the charging current. Performing the final top-off charge of the battery - this is usually a low current. Turning off the charger once the battery is fully charged. Performing any maintenance charge. Over time, the battery will naturally deplete called self-discharge (Lithium Ion batteries discharge at a lower rate than NiMH or Alkaline). This article details how to build your own solar power USB charger - a DIY cell phone solar charger. In the diagram above, you're attaching a series of smaller solar panels together to generate a voltage of 7V or more. The string must supply at least 7V because the drop across the voltage regulator (voltage from IN to OUT) is 2V for a standard 7805 regulator. You can choose another voltage regulator that doesn't have as much drop but they are harder to find (not stocked in Radio Shack or Frys) and they're more expensive. You'll need to experiment with a capacitor between the OUT terminal and GND as well. Typically a 10uF (microFarad) capacitor is fine. You will also want a capacitor between the IN terminal and GND. Use 10uF for this as well. This is needed to stabilize the +5V output. Another option is to buy one of these Solar Panel USB chargers. The ones shown in the following links include a battery so that it is more portable. Contact me if you're interested in the schematic for something like this. I haven't tried the 2nd or 3rd items - the 2nd item gets mixed reviews. You've decided you want to build solar panel technology, now you want to find out just how much DIY solar panels will cost. In this article we will do a little experiment – we will go to eBay, do a little searching, find the gear we will need to build solar panel arrays that are equivalent to commercially available solar panels, but at a fraction of the price. We will aim make solar panel of 36 solar cells, which will provide about 18V nominally, enough to charge a 12V lead acid or gel battery. We will be searching for WHOLE solar cells, although you can save even more money if you use broken cells – depending on how damaged they are you can still use them, but with lower output. Of course this is a “buy it now” type listing, I found many other auctions starting from $1 with just hours to go until bidding stops, so you can pay less than $32 if you try. An important thing to note is that the solar cells I have found on eBay and listed above are “untabbed” cells, which means you will need to “tab” them yourself. Tabbing solar cells is not difficult, but you will need some more stuff to get it right. An alternative is to pay slightly more, and buy your solar cells already tabbed, and this will save you time and effort. I found this auction (below) as well, which for about $4 more has the cells already tabbed. Bargain! Now we have our cells, the rest can be found in the local hardware store – you need plywood for a backing, small cross section timber for the frame, a piece of masonite for the substrate and a piece of perspex or plexiglass for the cover. The best part is, most of these items you can scrounge or reclaim from the rubbish at little or no cost at all! I also recommend you grab a copy of one of the guides currently available to help you with the build process. Doing this will save you countless hours, and will make the whole process fast, enjoyable and truly rewarding. Ebooks and information kits are available that include video tutorials, bonus information and tips on putting together whole solar power systems, plus extras light wind power generation and other renewable energy tips and tricks.